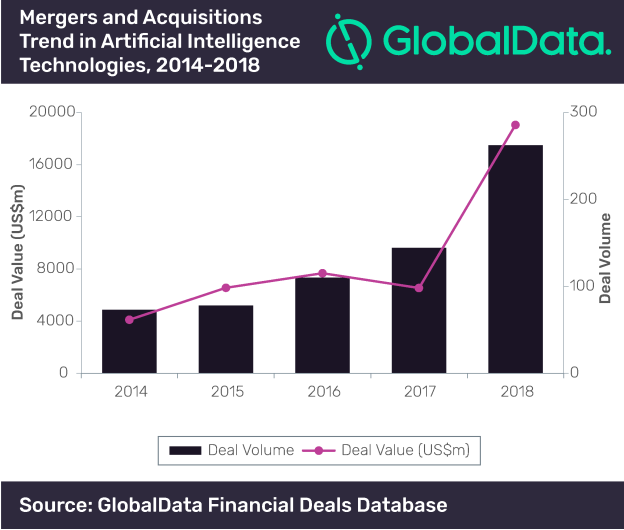 Artificial intelligence (AI) continues to be a lucrative technology space with the majority of startups either managing to secure venture capital (VC) backing or being involved in the thick of merger and acquisition (M&A) deal activity during 2014-2018. 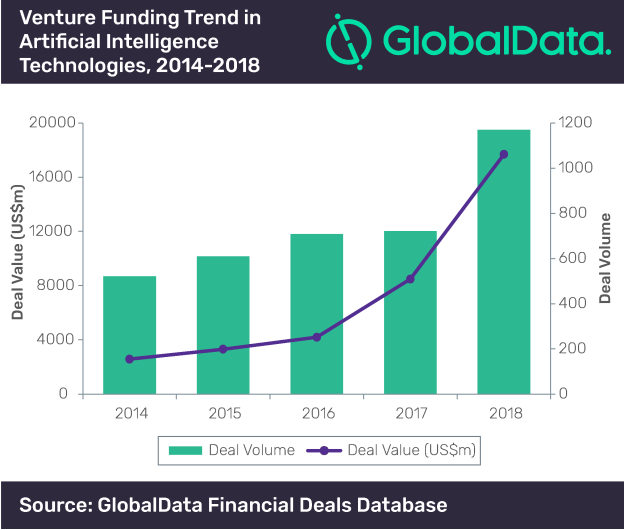 As a result, the race to fund or acquire AI-startups reflects the impact AI can have across various industries, says GlobalData, a leading data and analytics company. VC funding volume and value increased at a compound annual growth rate (CAGR) of 22.6 per cent and 62.7 per cent, respectively, during the review period. M&A volume increased at a CAGR of 37.6 per cent during the same period, with growth witnessing across all the years. Meanwhile, M&A deal value declined in 2017 after registering growth in two consecutive years 2015 and 2016. But it again registered massive ~190 per cent growth in 2018. American and European tech companies played a prominent role in the M&A activity, with the likes of Microsoft and Accenture emerging as prominent acquirers in 2018. Microsoft acquired Semantic Machines and Lobe Artificial Intelligence; Apple acquired Silk Labs and Asaii; and Google acquired AI-powered chatbot startup, Onward, in 2018. On the other hand, Accenture acquired big data and AI services provider Kogentix and an AI technology from Real Time Analytics Platform last year. Of the top five VC funded companies in the AI space during the review period, Sensetime, Horizon Robotics, Megvii Technology (Face++) and Yitu Technology were from China. While these four companies collectively raised ~$4 billion, Zoox – the only non-Chinese company to make it to the list of top five VC funded companies – raised $0.7 billion.